Frans Hals (1584-1666) was born in the city of Haarlem. Rembrandt surpassed Hals only in 1 respect, the romanticism of his light-effects. Hals was his equal in every quality. 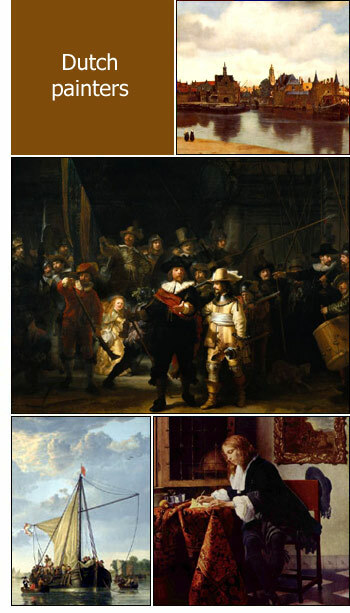 Rembrandt (1606-1669) was born in Leiden. His world famous paintings show show strong contrasts of light and shade, with the dark predominating. Adriaen van der Werff (1659-1722). Italian and French influences become apparent the time period he lived in, as can be seen in his work. Adriaen van Ostade (1610-1685). He became a fellow pupil with the Flemish Adriaan Brouwer in the Hals studio. His paintings are mostly taken from ordinary peasant life. Netscher (1639-1684) became very popular as a painter of the upper classes. He was a pupil of Gerard Terborch. Troost (1697-1750) was the last genre painter. His colour is bright, but his painting leaves much to be desired. His work gives, however, a clear insight of 18th century manners. Van Mieris (1635-1681) was a pupil of Gerard Dou. His works are generally of small size; the subjects, taken from everyday life, display great perception of character. Metsu (1630-1667) was a pupil of Rembrandt. His work shows him to have been an impressionable character. Metsu was born in the city of Leiden. Dou (1613-1675) was a pupil of Rembrandt. The subjects of his tiny masterpieces and the exquisite finish of their details completely captivated the taste of the public of his day. Terborch (1617-1681) was born in the city of Zwolle in an aristocrat family. He painted mostly the elegant manners of the beau-monde. Steen (1626-1679), with Hals and Ruisdael, is 1 of the 3 who fill the second step below Rembrandt's supremacy. Jan Steen painted mostly plain people and their lives. Vermeer (1632-1675) was born in Delft. He is original in the manner in his paintings in which he bathes his interiors in a diffused silvery light. Maes (1632-1693). While the portraits which he executed in his later years are excellent, he shows himself at his best in his earlier work, soon after he left his master Rembrandt. De Hooch (1630-1677) must be ranked with Maes and Vermeer. In his paintings he aimed to introduce different light effects through open doors and windows. Van de Velde (1635-1672) was born in Amsterdam. This painter was equally proficient in painting landscape, coast views, domestic animals, and human figures. Albert Cuyp (1620-1691) excelled in landscape painting. The calm, and brightly lighted countryside, the atmospheric effect of hazy mornings. Van Everdingen (1621-1675) studied in Haarlem and devoted himself to landscape, he painted also sea pieces and storms, representing waves with awful fidelity. Koninck (1619-1688) was born in Amsterdam. He devoted himself most to landscape. He received from his master Rembrandt that prepossession for distance and perspective. Avercamp (1585-1663), a deaf­mute, early showed his artistic talents, which he developed to great proficiency to depict the populous winterscapes of Dutch canals. Van Ruisdael (1628-1682) was destined to be the master of landscape art. He was the discoverer that two-thirds of all landscape is sky. He was the first great skypainter. Van der Heyden (1637-1712) had a fine sense of linear and aerial perspective. The delicate minuteness of detail in his pictures is kept in subordination to the general effect. Van Goyen (1596-1656) was the first to choose landscape art for itself alone. He was born in Leiden, where he received his first instructions from Van Swanenburgh. Hobbema (1638-1709), Ruisdael's pupil and friend, was neglected during his lifetime. He died poor. His landscapes are somewhat brighter in tone than his master's. The London-born Pieter Molyn (1600-1661) became a member of the Guild of Haarlem in 1616, and soon was called a "konstryk schilder," an artistic painter.